The P1000 is the next generation in Industrial Fan and Pump control, designed specifically for variable torque applications. Simple to use, intuitive, and user friendly are key features in the P1000 design. The P1000 supports a wide range of network and control options providing for the most flexible and cost-effective solution. 5-line, 16-character alpha-numeric display with time and date stamping for events, along with timer controls for starting, stopping, and speed changes without the need for external controls. Choose from pre-configured fan and pump setup macros to match the application for quick and easy set up. This new family of drives offers many benefits, including a design life twice as long as previous generations. For ease of setup, the A1000 supports DriveWizard software and a portable USB copy unit. In addition, Application Presets are available for fans, pumps, compressors, and conveyors. For demanding applications, the A1000 generates 200% torque at zero speed, with or without feedback. Continuous auto-tuning provides smooth operation, even at very low speeds. 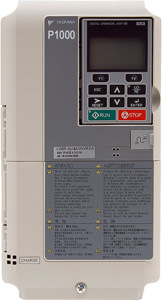 The V1000 is a world-class compact current vector drive that defines a new world standard. Demands for efficient production and better maintainability are on the rise, spurred by global competition. Yaskawa pays off the promise of being in control with products that make businesses move. The optimum balance of energy input, product output, maintenance risk, and long life is reached with Yaskawa. The V1000 compact VFD provides a world of power in the palm of your hand! The F7 series drives are the industrial workhorse that can handle every conventional application found within the typical industrial plant from simple variable torque (variable speed / adjustable frequency) pumping to sophisticated networked material handling. All of this is possible with the smart and flexible design platform of the F7 inverters, providing both normal and heavy duty ratings, four modes of control, network communication options, application specific drives software, and an array of standard and optional input output choices. The F7 adjustable speed inverters are factory programmed and ready to run. For operational simplicity and clarity, the F7 LCD operator display has 5 lines x 16 characters. 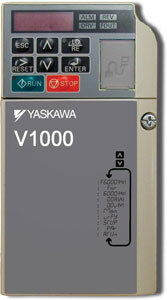 Yaskawa drives can be set to any of 7 languages. This amazing AC drive is the ultimate performance solution with increased speed and torque response to provide servo-like performance from an induction motor in speed, torque, or position control applications. In addition, the G7 drive has the world's first 480V 3-level inverter architecture that eliminates or minimizes the installation problems associated with IGBT switching (very long cable lengths, bearing currents, and common mode currents) and protects the entire motor-drive system. 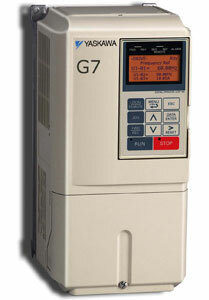 The G7 drive can be programmed using DriveWorksEZ software. This is a PC-based, object-oriented, graphical icon, programming tool that is friendly to the user. The G7 / Configured package provides a G7 drive in either a NEMA 12, UL Type 1 (IP22 or IP54 depending on the exact rating) enclosure, with space for factory-mounted and wired options, such as reactors, filters, circuit breakers, fuses, network communications and I/O cards etc. 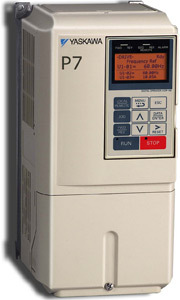 The P7 inverter is the industrial fan and pump drive. It is the companion to the F7 drive in fit and form. 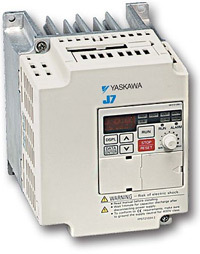 Yaskawa P7 inverter drive functionality is designed for variable torque applications like fans and centrifugal pumps. It is supplied with V/F control and normal duty overload rating of 110% for one minute. Network communications, plug-in I/O cards, and power/packaging options are available. With an optional phase-shifting input transformer, the P7 VFD inverter drive dual-diode bridge can be operated in 12-pulse rectification mode, reducing input current harmonic distortion. The optional P7 bypass package is a 3-contactor style bypass, allowing motor operation from the drive or across the line. The J7 drive is a general purpose AC drive; its PWM design provides low motor noise and high starting torque, with a current overload rating of 150% for 60 seconds. V/f control makes this AC microdrive suitable for most general applications. 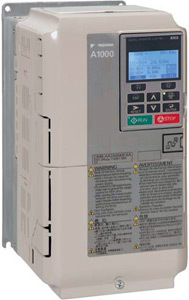 The J7 industrial AC drive is feature packed, low cost, and compact. The digital operator includes a 3 digit LED status display. Digital programming covers 79 parameters. The J7 general purpose drive has five digital inputs (3 progammable), 1 analog input, and 1 digital output (programmable). An optional RS 485 Modbus RTU serial communication port is available. 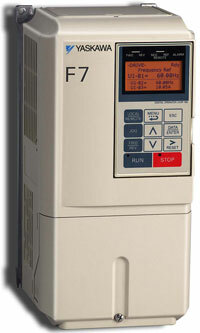 The J7 VFD drives are an ideal choice whenever low cost and small size are required. 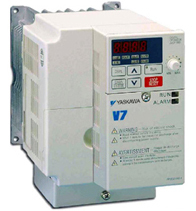 The V7 VFD drive is a low cost, compact drive, operable in V/f or open loop vector mode. In addition to good speed regulation, open loop vector control also provides higher torque at lower speeds. The V7 VFD drive is ideally suited for applications such as conveyors, grinders, centrifuges, pumps, fans,blowers, machine tools, packaging, food processing, and commercial laundry. For wet and dusty indoor environments, the VFD V74X with integral NEMA 4X/12 enclosure is recommended. For DeviceNet network applications, the V7N drives with embedded Device Net is recommended. The GPD 515/G5 AC drive incorporates a 32-bit RISC microcontroller to handle all logic functions as well as the complex, sine-coded PWM generating algorithms that control IGBT switching. Using flash ROM and Application Specific Integrated Circuits, the G5 drive provides the benefits of all-digital control, serial communications, and adjustments that don't age, drift or vary with line voltage. The G5 general purpose vector drive is such an excellent choice because it incorporates three control modes in one product; traditional V/Hz, open loop vector, and closed loop flux vector control performance. These Yaskawa AC drives incorporate the latest technological advancements in AC motor speed control, made possible by experience and dedication to quality in design and manufacturing. These Yaskawa adjustable frequency drives offer the greatest selection of size and performance available, with power ranges from fractional HP to 1750 HP. Yaskawa AC drives provide the benefits of network communications, support by software tools for parameter management, custom software options, and new ease of installation. Because all Yaskawa variable frequency industrial ac drives are rigorously tested, Yaskawa ensures that quality and reliability are designed in and built in. 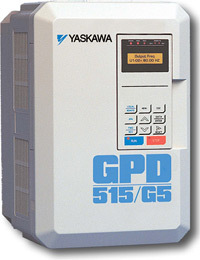 Yaskawa DriveWizard is a free Windows based software support tool for parameter upload/download, trending and graphing.